It’s a fairly recent image for today’s Picture in Time as we feature a view of Nottingham Express Transit 210 in 2013. 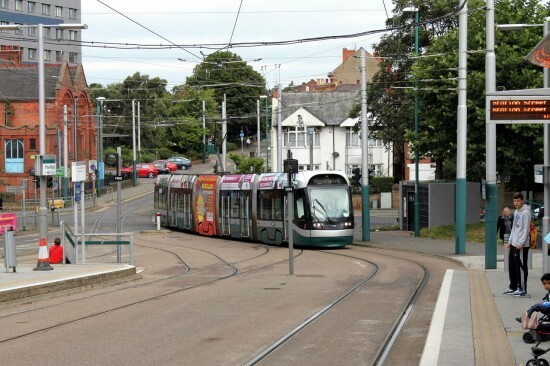 210 was one of 15 trams ordered for the original Nottingham Express Transit system. The Incentro trams were the last trams to be constructed in the UK with the work taking place at Bombardier’s Derby Works between 2002 and 2003. As with many of trams on second generation systems in the UK 210 entered service at the start of the line’s operation and has continued to run with a few different liveries but not much else to write home about. In this photo taken on 28th September 2013, 210 is in the original fleet livery including full height centre car adverts and further adverts above the windows. It is approaching The Forest with a service for Station Street.